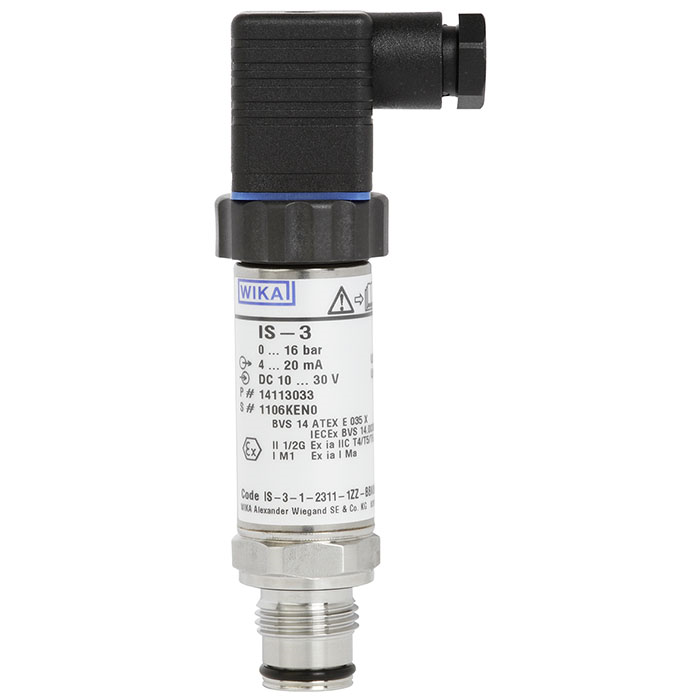 The pressure transmitters of the IS-3 series have been specifically designed for the highest industrial requirements in hazardous areas and feature the common approvals, such as ATEX, IECEx, FM and CSA, as well as a SIL rating per IEC 61508 / IEC 61511 for use in the process industry. The model IS-3 pressure transmitter is available with measuring ranges up to 6,000 bar and is suitable for applications ranging from general machine building to high-pressure applications. All wetted parts are manufactured from stainless steel and are fully welded. Internal sealing elements are completely avoided, so that the unit can be used with almost all media. The robust case is also made of stainless steel and provides a minimum ingress protection of IP65. IP68 versions are also available. The process connections with flush diaphragm are particularly suitable for the measurement of viscous and contaminated media and ensure trouble-free pressure measurement at all times. The optional field case of the model IS-3 enables operation in extreme environmental conditions and is resistant to acids, bases, oils and solvents. Via the field case connection integrated into the case's head, the electrical cabling can be installed quickly and easily. It is recommended that the intrinsically safe variants of the IS-3 series are powered via a suitable repeater power supply. An ideal voltage supply is offered by the intrinsically safe repeater power supply model IS Barrier, see “Accessories”.